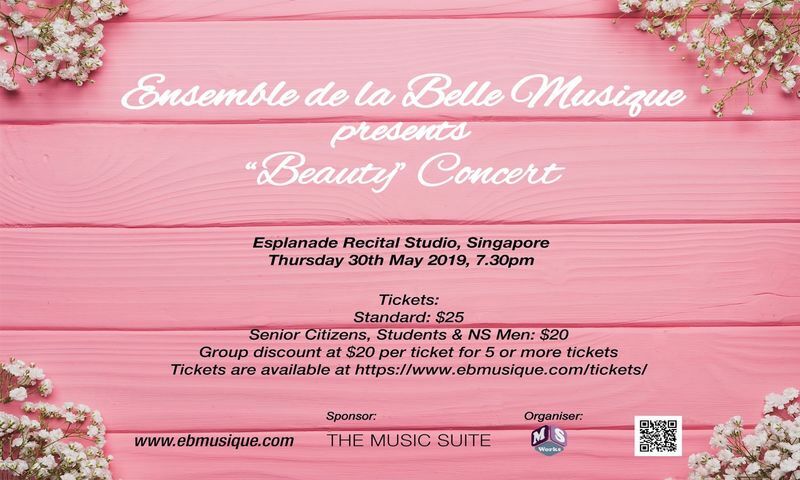 Following three very successful sold out concerts, Ensemble de la Belle Musique (EBM), a non-profit chamber ensemble from Singapore, is pleased to present its fourth concert, "Beauty". This concert will feature ten short melodious, tonal and easily accessible works written by living composers from all over the world. These works were written in various styles, so you can expect to hear an array of pieces with contrasting moods, colours, character and formations, with two written by Singapore's very talented young composers, Jon Tho and Victor Lin. This concert is suitable for people from all walks of life, people who are open to new experiences, and/or people who simply want to unwind after a long day at work. So do please join us in this unique concert, where you will be the first in the world to hear these lovely works. Please visit Ensemble de la Belle Musique for more information. Concert duration is approximately 1 hour with no intermission. No admission for children under 6 years old.